"When Lori Dewson isn’t seeking ancient mysteries to solve, they come looking for her. This time it’s in the form of a mask illegally looted out of New Mexico’s soil. Could it be the Hopi ceremonial mask of the Blue Star Kachina, or that of a prophetic priest with Toltec origins? Anthropologist, Anthony Peet, is already neck deep into the case. But there are others who have their own agendas for the artifact, which could mark the end for Lori and Peet – and the world. 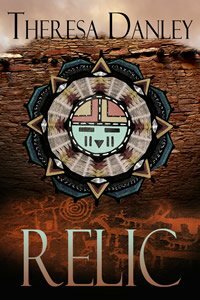 Relic daringly collides the Mesoamerican cosmologies first introduced in Theresa Danley’s archaeological thrillers, EFFIGY and DEITY, with the mythological and archaeological mysteries of the American Southwest."